Whether you’re serious about meeting fitness goals, love to have access to data every moment of your day, or are simply curious about your daily workout, this is the time to be alive! Fitness tracking technology is now more accessible and affordable than ever before. There are so many on the market, so what is the best fitness band? There are a lot of devices to choose from, but to find the best activity tracker for you it’s important to consider your needs and what you’re looking for in a device. The first step in choosing your activity tracker is to decide how detailed of information you want your device to provide you and then it’s a test of skills. What makes a good fitness tracker? How much you want to get out of your fitness tracking experience is up to you, and there is a wide range of devices to serve every need. One of the most important features for a fitness tracker is its companion app or software for detailed fitness tracking over time. Certain trackers don’t have companion apps and simply display data on the screen of the device itself, but the majority of activity trackers communicate with an app or computer over Bluetooth. Some companion apps have a social aspect to them, in which you can share your progress with family or friends either through the app itself or through social media posts. Social sharing is a great motivator for some people, but others prefer to keep their data private. Certain apps record only the data provided by the fitness tracker, but others allow you to input your own data either automatically through your phone (GPS) or qualitatively, like how you are feeling that day. For anyone serious about tracking data long-term, it’s important to find a fitness tracker with a user-friendly app suited to the amount of detail needed. Another consideration for choosing a fitness tracker is what kind of data it is capable of recording. Some activity trackers are worn around the wrist and include a heart rate monitor for the pulse. That data can alert the tracker to whether the user is sleeping or not; other fitness trackers require you to purchase a chest-strap heart rate monitor separately. It’s also a good idea to make sure your device is recording data accurately because some require manual input for sleep times and distance traveled, while others are better at tracking this automatically. The amount of data that the device can store on board is important because you don’t want to lose data if you neglect to sync it to the companion app for a few days. The same goes for the battery type; most are rechargeable but a longer battery life allows you some more wriggle room so that you don’t run out of battery during a big workout. Various activity trackers also can withstand different levels of water; some are waterproof to several meters deep while others are simply water resistant in showers. Finally, appearance is important to many people. Certain designs fit in better with professional or formal wardrobes while others look more like a workout watch. We’ve included several of the best fitness trackers on the market to help you choose the one that’s right for you. Best use: Swimmers and other water athletes. 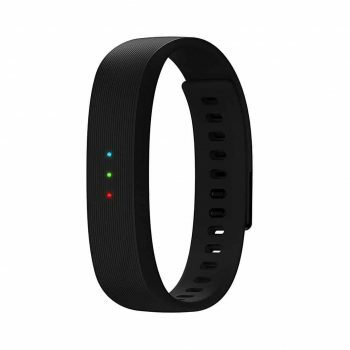 Description: The Polar Loop activity tracker is an affordable, lightweight choice for an activity tracker. To track your fitness data using the Polar Loop, you’ll need to download the Polar Flow app to your smartphone, which communicates with the Polar Loop via Bluetooth Smart. It comes in wristband form, and a Polar H6 or H7 Bluetooth heartrate sensor needs to be purchased separately to record heart rate data. While one major perk of the Polar Loop is that it is waterproof and can be used in the pool, Bluetooth Smart doesn’t communicate data well in the water even though the H7 heartrate monitor is waterproof. The battery life lasts about 5 days of continuous use and you can recharge it via USB. 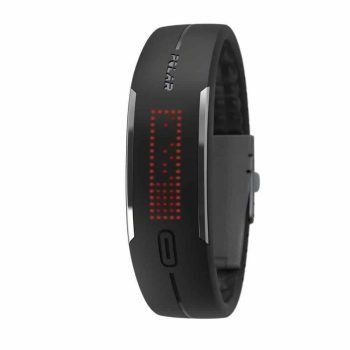 The Polar Loop calculates the calories burned through heartrate-related calculations. It also monitors your daily activity levels, steps taken, and your sleep patterns. This activity tracker can be found for about $50, but the H7 heart rate monitor will cost you an additional $55. Best for: Someone looking for an attractive fitness tracker with a great app for tracking activity, food and sleep data over time. 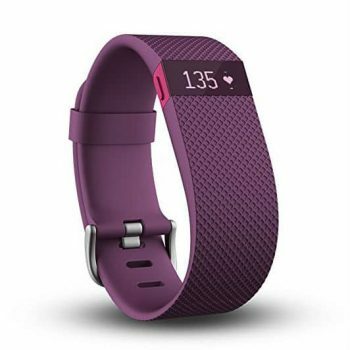 The Fitbit Charge HR is one of two options in the “Active Fitness” group of Fitbit fitness trackers. While it costs around $120, it records the user’s heart rate without the need for a chest strap as an additional purchase. The Charge HR is worn around the wrist and monitors heart rate from the pulse sensed in the wrist. It connects to mobile and desktop apps using Bluetooth; the apps offer additional fitness tracking services such as a food log and a social aspect for family and friends to stay in touch with fitness progress. 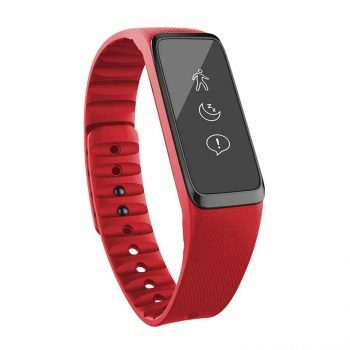 In case you forget to sync the device’s data to your phone or computer for a couple of days, the wristband stores 7 days of detailed fitness information onboard. This is also especially useful for those who wish to track their steps on backpacking trips in areas where phone service is unreliable. However, it’s important to remember that the Charge HR should not be used in the shower or pool. Its lithium battery lasts 5 days and takes 1-2 hours for charging. It also includes a caller ID on the screen when Bluetooth is connected to a phone, which comes in handy for taking or rejecting calls when working out. The Fitbit Alta is a popular choice for an activity tracker because of its unassuming design and interchangeable wristbands that come in leather and metal choices. While it costs $130, it does not include a heart rate monitor. Like the Charge HR, it syncs automatically and wirelessly to phones and computers using Bluetooth 4. It has a lithium rechargeable battery that lasts for 5 days of continuous use and uses a USB for recharging. The Alta can sense when you’re sleeping and records data to help you monitor your sleep patterns. It can also sense when you’re exercising or sedentary, and will send you a reminder to move. It can also be programmed to send call/text alerts for exercise. Despite its small size, it records quite a bit of data: number of steps, distance traveled, calories burned, and activity levels. The detailed data can be stored for 5 days. One disadvantage is that it can’t be worn in the pool, but it is showerproof so it’s not such a big deal if you accidentally leave it on when you shower, which is a danger for the non-water resistant designs that you could ruin easily. The Alta definitely takes the cake as the most attractive activity monitor, but also forgoes some desirable data like heart rate. Best for: Someone looking to try out a simple, lightweight fitness tracker before upgrading. Razer is company that is generally known for producing gaming products, and the Razer Nabu X is its first activity tracker. At 0.3 ounces, it is an extremely lightweight device for $50. The Razer utilizes two apps to store fitness data. The Nabu X has a big focus on sociability and will notify you with three different blinking LED lights and vibrations, including when there is another Nabu X user in the area. Developers are working on making games that involve wearers of the fitness tracker. Its lithium battery lasts 5-7 days and includes a proprietary port for charging. It’s also water resistant up to one meter so it can be worn in the shower. Some users get overwhelmed by the variation in vibrating/light alerts given off by the Nabu X, and the iPhone version of the app has been known to have a few problems. Overall, for $50 it is a great choice for someone looking for a more social fitness band or wanting to try out a lightweight band without spending a lot of money. Best for: Someone looking for a device that monitors heart rate and doesn’t need a connection to an outside app. The Lifetrak Core C210 advertises an “ECG Accurate Heart Rate” and calculates your percentage of maximum heartrate. It’s a really low-maintenance activity tracker because it does not need to be connected to a phone or computer; all of the data is displayed on the screen. Its coin cell battery has a one-year life so you don’t have to worry about charging it often. Having no need for an app or computer connection is great for some people, but if you want to store your data so that you can go back and look at progress over time in a more convenient style a fitness tracker with an app and computer connection would be a better bet. 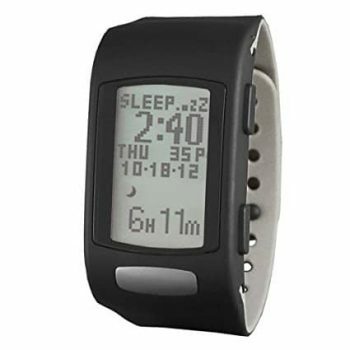 The Core C210 does store 7 days of data, however, are records your sleep patterns, calories burned, steps and distance. For $60, having a fitness band with a heart rate monitor is a good buy. Related: LifeTrack Zone C410 is similar but includes an app connection. Best for: Hikers in hilly terrain; the altimeter takes into account climbing when calculating calories. 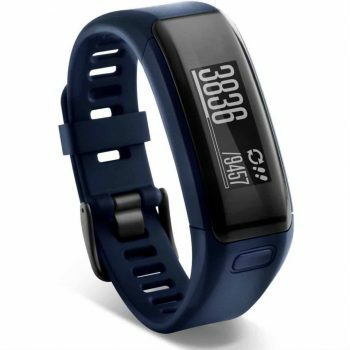 While the Garmin brand is usually associated with GPS-enabled devices, the Garmin Vivosmart Heartrate Activity Tracker does not have the capacity to record GPS data. Nonetheless, because GPS capability in fitness trackers generally costs much more, you are still getting the Garmin brand for $130. It connects to a mobile or desktop app, and can be linked to a My Fitness Pal account or to Garmin Connect. The Vivosmart HR is relatively small for a Garmin device and is water resistant to 50 meters. It can also receive phone alerts when connected to a phone wirelessly. Another great feature of the Vivosmart HR is its altimeter, which detects when you’re ascending stairs to apply to the calories burned count since you burn more calories climbing stairs than walking on flat ground. Its heartrate monitor is convenient because it collects heartrate data from your wrist rather than dealing with a chest strap. Overall, the Vivosmart HR is a high quality fitness tracker, especially if you prefer the wrist-based heartrate monitoring design. Best for: Someone who needs to operate their phone from their wrist while working out. The Striiv Fusion wristband tracks your steps, distance traveled, minutes of activity, and calories burned, but not heart rate. It connects to a smartphone over Bluetooth and allows you to control the music playing from your phone so you can pick music while working out without worrying about pulling your phone out of your armband, etc. to change the music. The Fusion features a touch screen, which scratches relatively easily, and shows calls, notifications and texts from a phone on the screen. It does connect to the Striiv app, which includes a social aspect for data sharing. Its lithium ion battery lasts about 7 days of continuous use but will be depleted more quickly if you have a greater number of phone calls and notifications. The Fusion also comes with swappable bands in red, blue and black. For $70, the Striiv Fusion is a good option if you want to be able to operate many functions of your phone from your wrist while working out. Best for: Someone who wants to record more than basic fitness data in the companion app. At $180, the UA Band is one of the more expensive activity trackers reviewed here. What sets the UA Band apart from other fitness trackers is its app. The UA Record app allows you to enter data that many other apps don’t have an option for, like how you’re feeling that day and body fat percentage. The band itself gathers data on sleep, resting heartrate, and workout intensity. One thing to be aware of when it comes to the heartrate data is that the UA Band only collects resting heartrate data. In order to gather heartrate data for intense workouts, you’ll need to purchase a chest strap separately. The battery lasts about 3-4 days per charge, and takes 30 minutes to charge. The UA Band is not waterproof but can withstand sweat or a shower. Its touch screen also allows you to control the music from your phone. It does not have GPS capability in the device, but it can connect to your phone via Bluetooth Smart and transmit your phone’s GPS data to UA Record. The UA Band also stores data for 7 days. 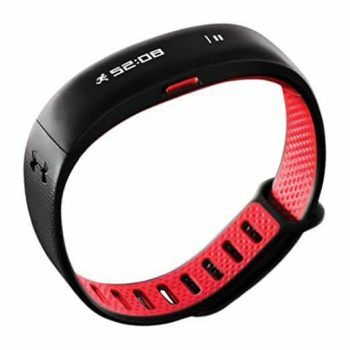 Because it’s so expensive for a device without a full- spectrum heartrate monitor, the main draw of the UA Band is that it’s set apart by its unique companion app for detailed data tracking. Every fitness tracker is a little different but depending on your activity level and how much data you wish to record, everyone can find one that fits them best. Every tracker is a little different when it comes to what kind of activity it records and how it uses its companion app to help you keep track of data. The fitness trackers we reviewed here cover a wide array of uses and a wide price range to help you find the right one for your budget. The market has many great fitness tracker products, and the technology is constantly being updated. What is your favorite activity tracker and how do you use it in your daily life?